Today, React Presents has announced the Trance Arena Concert Series that will bring the best of the best in Trance music to Chicago. 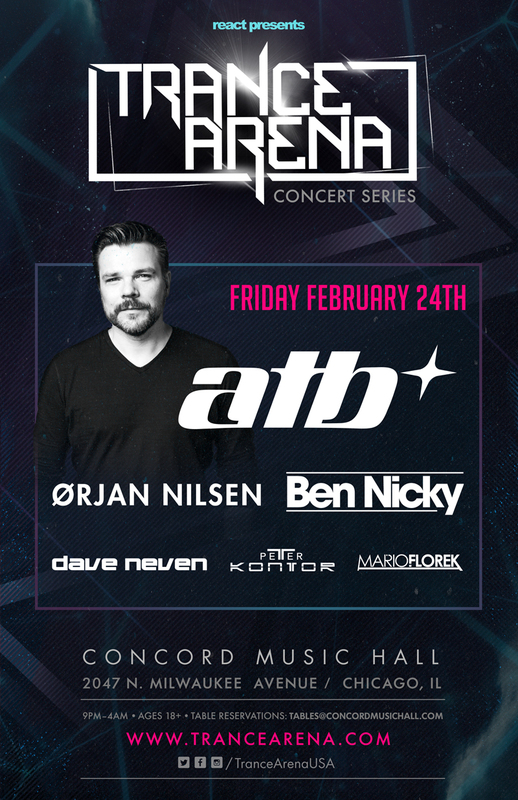 ATB, Ørjan Nilsen and Ben Nicky are all confirmed to headline the 7-hour event. The one-night premiere kicks off on Friday February 24th at Chicago’s Concord Music Hall . If you’re familiar with the music festival known as Spring Awakening, you can expect all the great visuals, lighting and production that captivates concert-goers in the one-of-a-kind atmosphere. It’s a dream come true for Trance fans. Tickets are on sale now, you can purchase HERE.